1 Time, space and matter including radiation and material beings are fundamentally integrated. Time and space are existential form of matter. They are all united to form the universal organism. They are self-creative matters. Space, time and radiation unfold themselves in a trialectically creative movement. Dimensions of time and space (3 for time and 3 for space) are sensible at definite levels of the development of sensation. 2 In order to postulate a model of a universe, we must and necessarily should postulate it with reference to the levels of being and the creature of reference. We have not arrived at truths yet. We are trapped in our being. Being of lower man, being of dogs and being of plants have their own model of the universe. For being of stone, there is no model. Solids resulting from the movement of surfaces. Fundamentally, 3-dimensional after absorption of the first and the second dimension. The first very obvious time is its 1-dimensional property, that is, moving in a straight line. Known to being for himself and for others, that is, his time line. This is the first dimension of time. This time being is indistinguishable and therefore appears unique in the subjective. But material objects have their own time, own beginnings and own endings. This leads us to believe that times are distributed for space or dimensions of time. This is the first dimension of point time that could move to form line time. It is an irreversible line not necessary straight, and something that can be felt to move with or without an object. It is the unique subjective without source of its arising. It is time for a given space or life of space. This leads to planar time or line time at various “lengths”. They are distributed in a time surface. Some begin as soon as the others end. But they are all on a plane. A given time commences with a given phenomenon. This phenomenon is subjected to other time axes. A man, for instance, is subjected to the growth time, but it is also subjected to other time axis such as locomotion time of the time lines on a planar time. Surfaces of time or solid time, and could be used to explain reincarnation phenomenon during and after death for our brained beings. Times on the many planes; as many time-stopinders with respect to our plane of times. Time in other planes. Time continuum’s continuous presence, immortal and eternal. The 7th dimensionality is the eternality of 3-dimensional time. Neither beginning nor ending in times besides the concealing fluxes of specific spaces and times. 3 All further stopinderings beyond this dimension-stopinder involve the blending of spatial phenomenon with the temporal or time phenomenon up to the eternity dimension. At ‘perfect’ motionlessness or motion of spatial objects, the time dimension seems to be always present independent of the source of arising. There is no direct link at between mi and fa at the mi-fa retardation. A shock called time is necessary to fill this retardation point. The source of its arising could not be traced. This shock enables the time dimensionalities to stopinder into the continuum more smoothly to create the near complete space-time continuum. 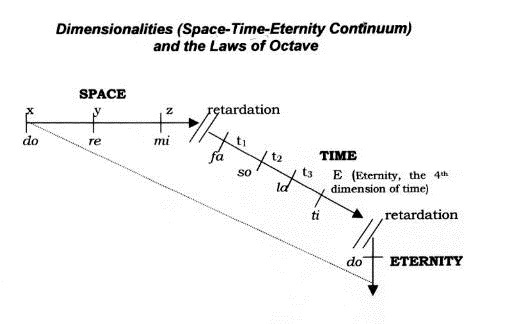 So, the active partial octave of dimension stopindering (do-re-mi) is the first partial octave of space. The second partial octave stopindering (fa-so-la-ti) is the second partial octave of time. The two could not be reconciled and seem to be opposites. The last dimension retardation entity to fill the I-do retardation point is simply eternity. 4 The octave of dimensionality begins from do and ends at ti. Our reflecting apparatus on space and time is as such that space and time, although they are both dimension entities, could not be integrated properly. Besides space and time, eternity, which is also a dimension stopinder could not be integrated properly into the continuum. By treating the whole continuum as a dimension octave, the whole concept can be put together. This is because there are two retardation points in the octave model where two shocks could be allowed into the continuum ‑ one at mi-fa and another one at ti-do. The union of space and time, I propose, should be shocked with time to produce the space-time continuum and the union of space-time continuum should be shocked with eternity to produce the space-time-eternity continuum ‑ the complete octave of dimensions. 5 All spaces and times in the 7th dimensionality is eternity. Such is being space and times for existences. Space. time and eternity are the three partial octaves forming the complete picture of the octave dimension. And space is being-space, time is being-time and eternity is being-eternity. The Absolute has the complete dimension of ETERNITY because He is immortal. The Absolute contains all the dimensions in Him. The dimensionalization process of the Ray of Creation is one of the inevitable processes of cosmic stopindering into the sevenfolded being-Universes. 6 People speak of the Earth as a three dimensional material body, ignoring that it could be a four-dimensional living being or even a seven-dimensional being perpetually changing. The Earth is able to see its own self through her organic beings breeding on her skin. She has these beings with well-equipped reflection apparatus for this purpose. For higher organic beings such as the humans, five or six or seven dimensionalities could possibly be pre-conceived (perceived and conceived); for lower beings, one or two or three or four dimensionalities. The Earth is created by the cosmic octave, while modern man is created by the organic octave of Earth. 7 The ray of psyche vision belongs to the fourth dimension of every material body and for dimensions that lie within a three-dimensional space but at the same time manage to leave it. These dimensions are inherent in the three-dimensional body and remains unseparable from it. Mechanical matter has 3 space dimensions and 1 time dimension, and psymatter has 3 space dimensions, 3 time dimensions and 1 eternity dimension (everpresent) completing holistically all the 7 dimensions of a Dimension Octave with 2 intervals separating 3 suboctaves, namely, the space octave, the time octave and the eternity octave, each can be psychological perceived by a human being as distinct components in the ray of creation of dimensions. The space sub-continuum is the house of the space octave housing visible physical bodies subjected to the mechanical laws of 3 dimensional space and 1 dimensional time. It is the house of engineering and technology as well. The time sub-continuum is the house of the time octave housing ghosts, apparitions, genies, devil,mysticism, lower gods and the whole ranges of phenoumena with beings of reincarnation powers. The eternity sub-continuum is the house of the Great Good, the higher gods, the Absolute, the Buddhas, the Allah, the immortal beings with ever-presence. It is the house of Nirvana and the Kingdom of Heaven. Professor Dr. Tan Man Ho has explained this new discovery model of Space-Time-Eternity Continuum clearly that the basic laws of octave applies to the creation and growth of physical and temporal dimensions, namely spaces and times within a biological being and the universe as being holistically. This is new physics for our times.